I am so glad you are here. You should have come to me by way of Kim Duran. This time the theme is all about RED. Red is one of my favorite colors to play with and I decided to do a tag this time. I have been loving playing with tags lately. I love this Lawn Fawn set called My Cup of Tea and had so much fun inking it for the first time. Supplies: cardstock: Elle Erre Fabriano! ; pattern paper: Echo Park Dots & Stripes Candy Shoppe 6X6; stamps: Lawn Fawn My Cup of Tea; inks:Momento (Tuxedo Black, lady bug); embossing: Versamark ink, Ranger's Tinsel Red embossing powder. I am also entering this for the Lawnscaping Challenge#23 - Tags or Treat bags and Wee Memories Challenge#78 - Free for all. Next head on to Vera Rhuhay blog. If you've gotten off track, don't worry! Head on back to Lawnscaping to see the complete list of designers and prize information! wow this is so cute .. love the way you have used the stamp...and the sentiment is too cute...your inspiration is just fab!! tea for TWO and such a lovely tea pot that it! Love the striking red with the sweet polka dot papers! Wow...so cute,Ujiwal! I love your glittery tea pot! very cute! i dont have this stamp set yet but you've used it beautifully! Thankk God!! We get to see a post from you....have been lurking around your blog almost thrice & more every single day... Missed your posts Girl!! And U're back with a B A N G !! What a lovely tag and ready for both season greeting or Valentine's! So cute! Love the hearts coming out of the teapot!! Absolutely adorable tag! My best friend of 35 years and I have exchanged tea-themed things for many, many years - thanks for a great card idea for her! Love this! so I was dog sitting at my friend's place and happened to go through all your posts and let me tell you I went to the oldest and the first post ..sans a formal introduction which people usually do in their first post...came across your wedding pics..your youtube videos (I love chubby hands :D)and blah blah..
What a cute tag and a tea-rific idea. cute cute tag...love that embossing.. So cute. Love the Red. Very cute tag! I love that glittery tea pot! This is so sweet! Love all the hearts coming out from the wonderful, glittery teapot! I love the heart steam coming out of the teapot.....tea-riffic! Oh, how cute! That red tinsel embossing powder looks amazing! Aww--that glittery teapot is so sweet! What a cute tag. 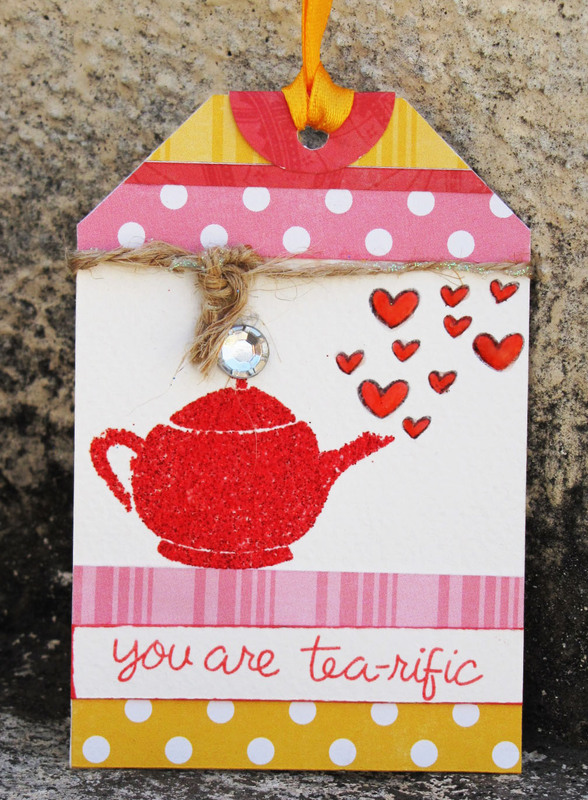 love your embossed tea pot! very cute! Great tag! Love that glittery teapot! Adorable! Love how you used a gem for the knob! Super sweet card! This teapot is one of my favorite too! What a cute tag! Thanks for sharing! Very cute! The glittered tea pot is totes adorable! 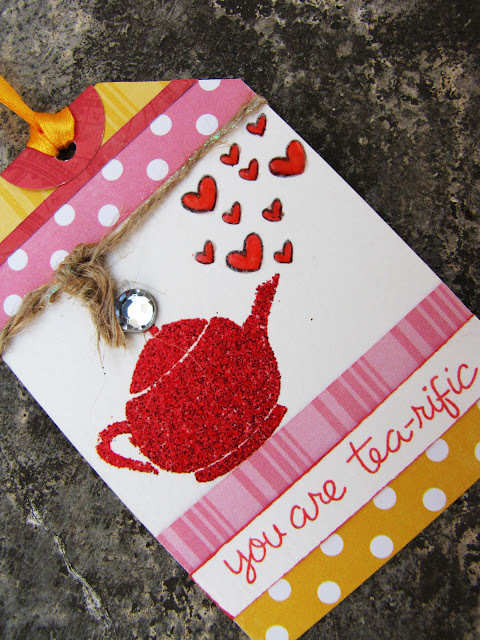 Lovely tag, the glittered teapot is super cute! Love the glittered tea pot! Such a great way to add some sparkle to the card. What a nice tag ! Love your blog! Your tag is wonderful - fun colors and of course the RED teapot! 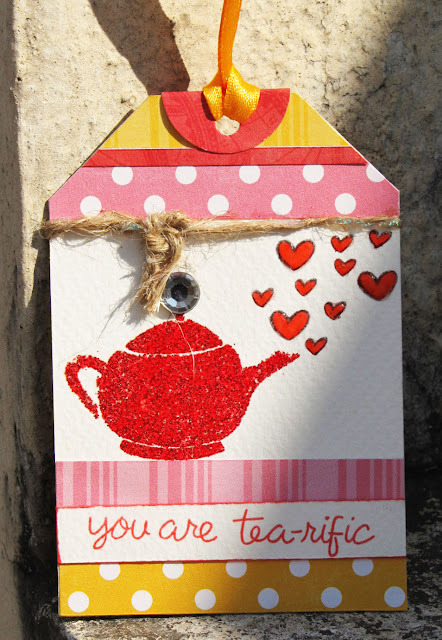 What a tea-rific card......little girl giggle, I could not resist it is so cute. what a great all ocassion tag. Love the glittery red teapot. Cute! I love tags and what a great choice with the tea! Thanks for sharing...great color combo. Very cute tag! I like how the teapot is "pouring" love with all those hearts. Awwwww, I love the little hearts coming up like steam from the teapot. So awesome. Gorgeous tag! Love the sparkly teapot! TFS! What a cute little tag- and anything Lawn Fawn makes my heart go squee! Adorable tag! Hard to go wrong with Lawn Fawn ever! So cute! Love the red/yellow comination!! Such a fun and bright tag! great tag, and it works all year around! Great tag! Love the colors and the sparkle. What a sweet tag! I just love that little tea pot and the sentiment very cute!! Ujjwal its such a cute tea tag :)) adorable. What a happy tag!! Super cute! I just lve the colors! Thanks for the chance to win one of the great prizes! Great tag, I love that tea pot! Its nice to see something that could be used for the next holiday (Valentine's). What a cute idea and I love the stamp set too! This is amazing! So nice to see something non-holiday as well. I think I need to get that embossing powder! Very cute--I like the glittered tea pot. What a beautiful tag, Ujjwal! I love the red tinsel embossing powder! Cute tag and I love the tea theme! Very nice. Thanks so much for a chance to win some Lawn Fawn goodies! Love the colors and tinsel embossing powder of your tag Ujjwal. Love this fun tag with gorgeous colors! Love the little gem on the teapot! I love this cute tag! must say..u know how to play with colors....very cute..
Over at Pie Lane Blog! + Giveaway! Prickley Pear Inspiration + Tutorial!